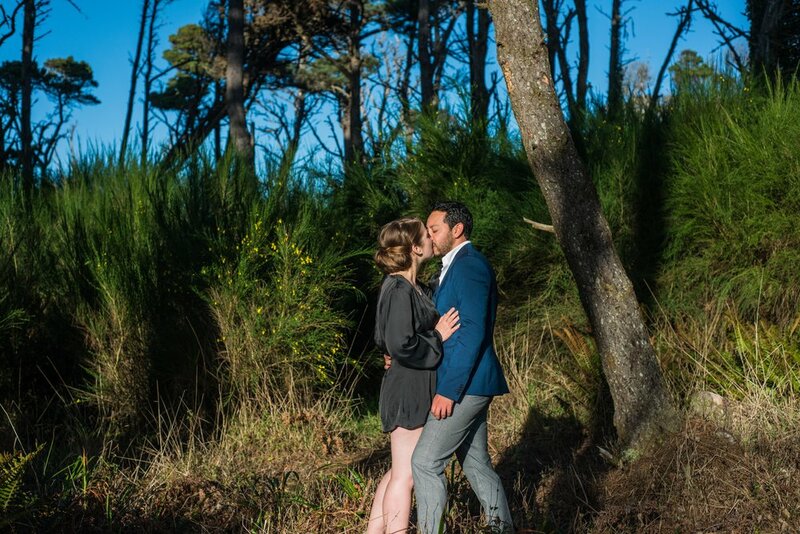 I met Amy and Rual at a little coffee shop in Fort Bragg a few weeks before their engagement session. It was kismet. We had so many things in common with each other. Amy's love of tacos and margaritas. Raul's gypsy soul. I just couldn't get enough of their fun and adventurous personalities. Needless to say, they ended up booking their wedding with me. 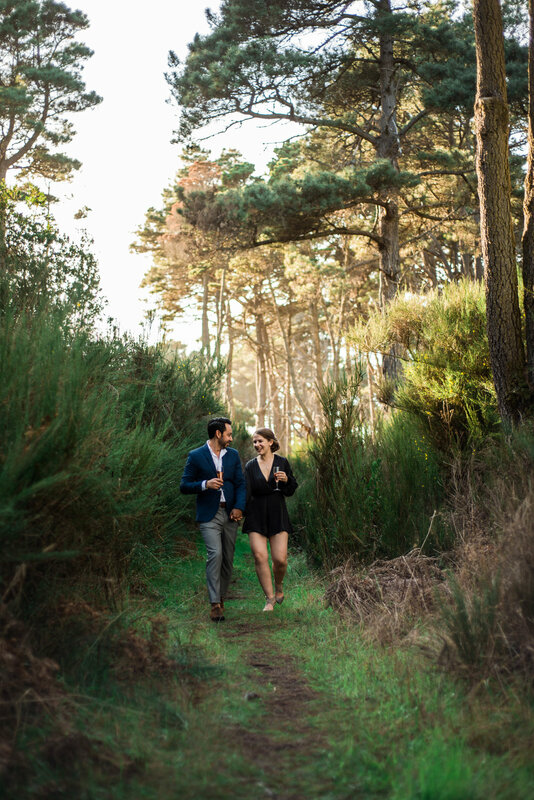 All of my wedding and elopement packages come with a complimentary engagement session. 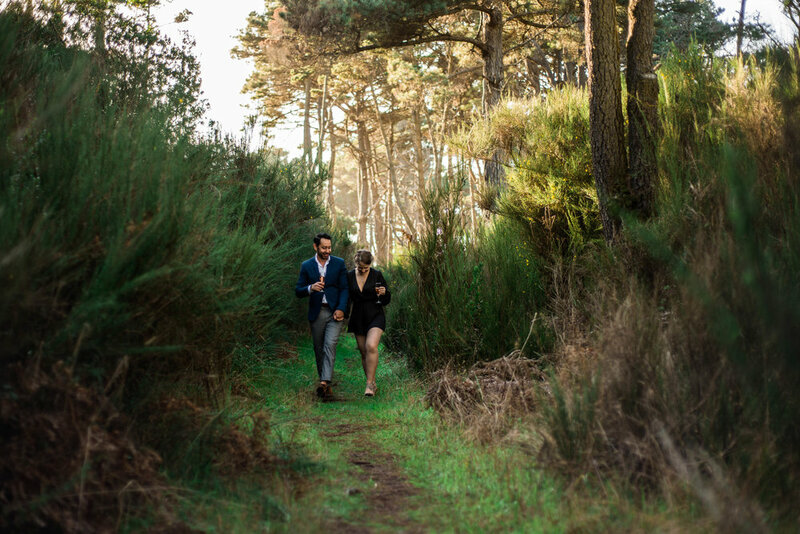 I feel it is important for both myself and my clients that we have a chance to get to know each other prior to what will be the most significant day of their lives together. I NEVER want my clients to feel like they have a stranger at their wedding putting a camera in their face and directing them in a way that makes them uncomfortable. Enter the engagement session. 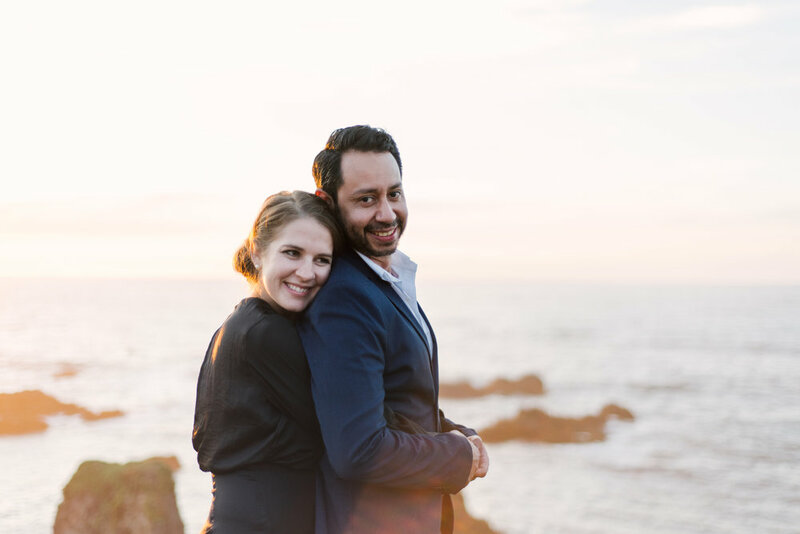 Amy and Raul chose the location, which was their coastal residence that will also serve as their reception site. Just a days prior to their session it had been pouring down rain. God showed up big and gave us a beautiful day! The coastal views in Fort Bragg rarely disappoint, and our day together was no exception. 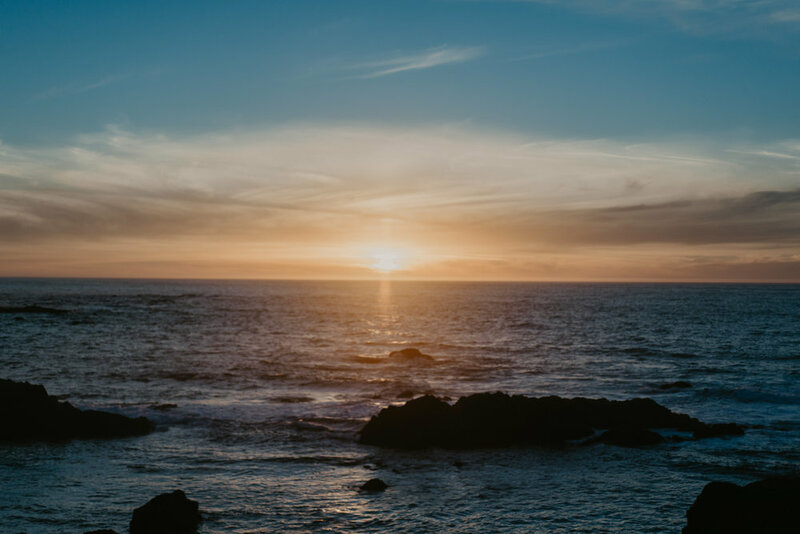 We spent a couple of hours together exploring the property (which is littered with beautiful trees and foliage), whale watching, and viewing one of the most beautiful winter sunsets I have seen in my lifetime. As we sat and watched the end of the sunset together, Raul admitted to me that he had planned on proposing to Amy while they were in Alaska. His ultimate plan was to propose to her on a glacier. Weeeelllll, that DID NOT happen. He had the ring and was terrified to propose while they were in Alaska. So, instead, he proposed to Amy at the red bench that are in these photos. Fort Bragg's coastal views are an awesome consolation prize to Alaskan glaciers if you ask me! Obviously Amy wasn't disappointed and these two love birds are due to be married this summer, so, way to go Raul! 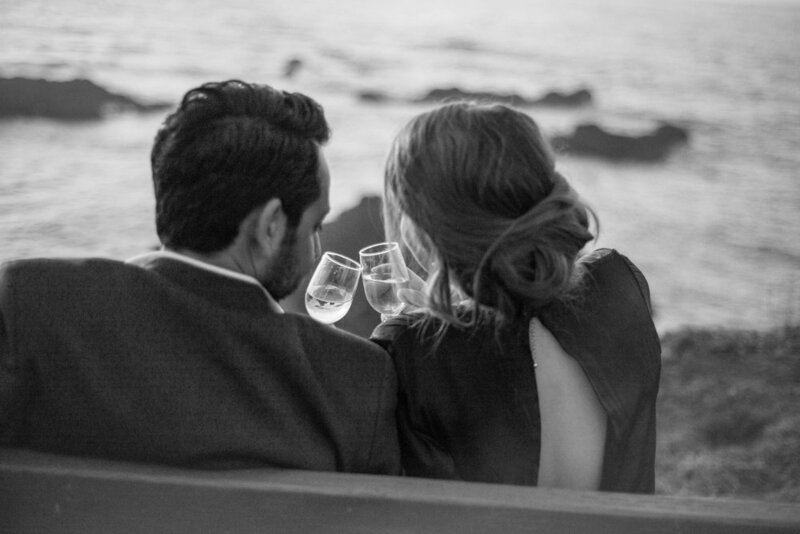 Enjoy this beautiful couple, the beautiful views, and the love these two share! Do you love photos that capture laughter and love? Wanna have some fun on the coast, get wild and adventurous for some photos? You can book your engagement session with me, or shucks, it can be just because, I'm game! Let's have some fun together on the coast, or anywhere for that matter! You can book with me here . 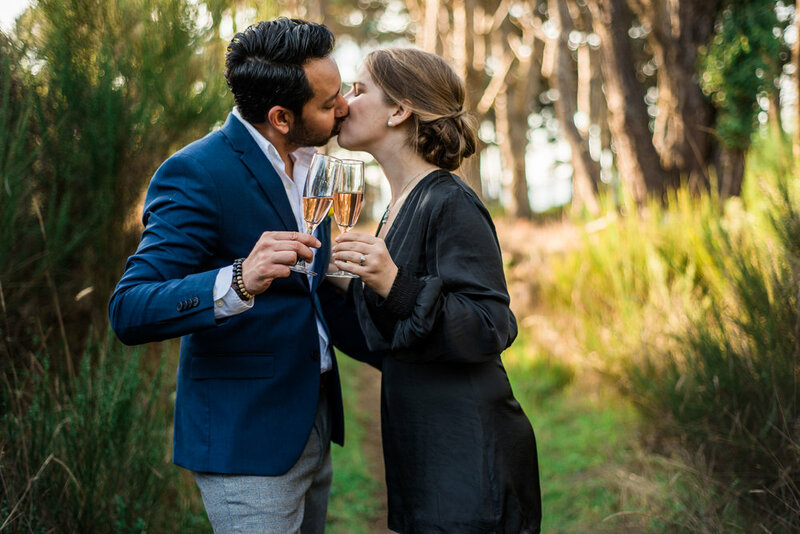 Chelsi is a destination wedding and elopement photographer based in Fort Bragg, California but loves to travel and will go anywhere to capture your life's sweet moments. She lives for seeing the world, capturing authentic love, and making people feel fabulous. Her style is authentic, real, and emotional. She believes in laughing too much, singing too loud, and most importantly living life to the fullest and capturing every single authentic beautiful moments that evoke emotions over perfectly posed photos.